You never know what you are going to find along mountain roads. Friends had told us about Tuggles Gap Restaurant. They said, "It looks like an old gas station. you can’t miss it." Located on Route 8 in Southern Virginia where it crosses under the Blue Ridge Parkway, this mountaintop restaurant and motel has been open 7 days a week for many years. The menu states, "All American Cuisine Featuring "Down Home" Country and Southwestern Cooking." 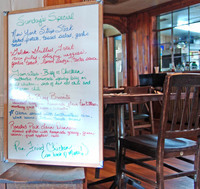 We found that to include generous portions of good food served in comfortable rustic surroundings. They offer wines from Chateau Morrisette and Villa Appalachia and a selection of imported, domestic and Non-Alcoholic beers. Being a fancier of non-alcoholic beers, I was pleasantly surprised to find this out-of-the-way restaurant offering more than one variety. 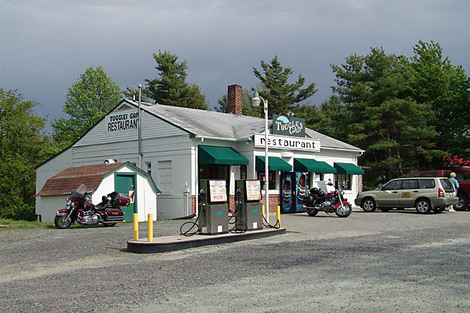 You walk in the front door and find yourself in a tiny bar area which seats a dozen people in a long narrow space which also includes shelves of motor oil, transmission fluid and other medications for your motorcycle or truck. If you look carefully, you will see a door to your right which leads to a series of dining areas which seat about 70 people. The place is much larger than it appears. Entering the first dining area, you see the specialties of the day. (Click on image to enlarge.) Everything we tried was satisfying and filling, but there are a few specialties you need to leave room for, if possible. 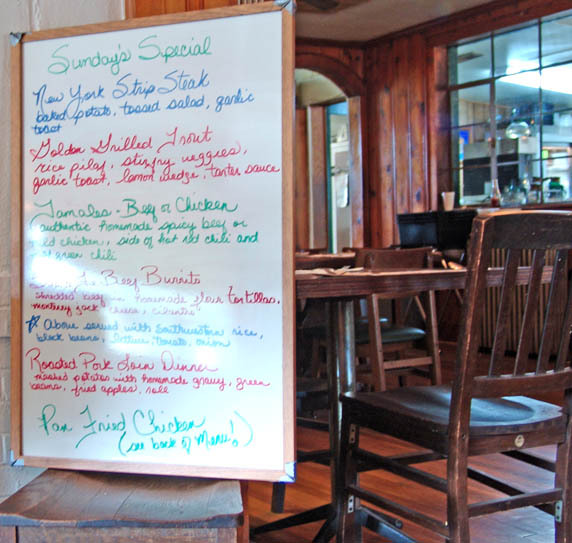 Their beer batter French fries are delicious, the Tuggles Gap pie is irresistible, and we intend to try their famous Pan Fried Chicken which is served every Sunday. The atmosphere is a surprising mix of country and high-tech as this is a favorite rendezvous for bikers, hikers, and local people. You hear discussion of marketing strategies, crop problems, and gear ratios. Seven huge bikers came in while we were eating and sat at a table near us. A hard-looking group wearing worn riding clothes, they immediately launched into a booming discussion of mechanical problems interspersed with chatter with the waitress. A few minutes later, we were struck by a sudden silence that lasted for about a minute. Turning around, I saw them with heads bowed, praying over their food. When grace was done, they resumed their boisterous discussion of motorcycle arcana. At another nearby table, two cyclists discussed hamstring problems, blisters, and their progress along the Blue ridge parkway. I watched them limp out into the night with more than a little sympathy. They have many miles to go in order to reach the nearest town. Gretchen and I went back the next night to meet with Doug Thompson of Blue Ridge Muse and his wife Amy. Slowly but surely we are working our way through the Tuggles Gap menu and it has not failed us. This is fortunate because it is the only restaurant open seven days a week near Floyd, Virginia. It also has work by local artists on the walls. This entry was posted in Daily Drama, Food and Drink. Bookmark the permalink. I thought never in a million years would I see a blog post about this restaurant. Although I have never been in there, I do travel by it frequently. Have you opened yet? If not When? This types of the restaurant are mainly seen at the Europe side . Were you can fill the gas as well to can do a dinner .